I’ve eaten eggplant rollatini at a restaurant and loved it, but I had forgotten about it until recently when I was out and ordered it again. I knew that I had to try to recreate it at home. A meal this good should not be forgotten about. Usually in preparing this dish the eggplant is breaded and pan-fried in oil till crisp tender, but in the interest of lowering the calorie content I elected to broil the eggplant slices with equally good effect. Once baked the edges were crisp, but the centers of the slices were moist and tender. 1. Preheat the broiler. Line 1 or 2 baking sheets with parchment paper and spray lightly with non-stick cooking spray. Dip in egg wash, then in seasoned crumbs. Lay prepared slices on parchment paper-lined baking sheets. 3. Broil for about 4-5 minutes on each side, till nicely browned, but take care not to let them burn. Turn over and cook another 4-5 minutes. They should be browned but pliable, not crisp. 4. In a medium bowl, stir together the ricotta, garlic, egg yolk ( or egg substitute), mozzarella cheese, and seasonings. Divide evenly among all the slices of eggplant and spread evenly. Divide filling among slices and roll up. Starting at the narrow end of each slice, roll up tightly and place seam side down in a 9 x 13 inch baking dish. A toothpick may help keep them rolled. Pour marinara sauce over the rolls, and top with the 1/2 cup mozzarella cheese. Pour marinara sauce over the rolls and top with shredded mozzarella cheese. 5. Bake for 15 – 20 minutes, until heated through and the cheese is melted. 6. While the eggplant rolls are baking, bring a large pot of lightly salted water to a boil. Add the pasta, and cook as package directs for the type of pasta you are using. Drain. 7. Serve eggplant rolls and sauce over pasta. Often my cravings dictate what I cook more than what’s available in the produce department of the supermarket. However today’s meal is not one of them. At the market this week bell peppers in all colors were specially priced, there was a load of zucchini, medium sized and tender and in the frozen foods section cheese ravioli in all shapes and sizes were being featured. All that spoke to me, no, shouted at me, ” hey, don’t you think we belong together?” Embarrassed by all that shouting, I quietly gathered them up and put them into my grocery cart, while thoughts of sugarplums, casseroles, danced in my head. Somewhere in the farthest corner of my brain I remembered seeing a recipe that used cheese ravioli and zucchini together. At the time I thought it seemed rather bland, but after I searched it out, and thought about how I could tweak it, I used it as a basis for this version that turned out to be rather fabulous. Mr. D. said he thinks he likes it better than vegetable lasagna. The ravioli and vegetables are surrounded by a creamy, not-too-thick cheese sauce, giving the whole lots of flavor. This was so satisfying, all it needed for completion was a green salad. This is definitely a make-again meal. A bonus to this meal is that it takes very little time to prepare making it a good week night meal, and its meatless too! 1. Cook the ravioli as its package directs. 2. Combine cream and chicken broth in a saucepan. Bring to a boil. 3. Melt butter in a large skillet, sauté the onion until translucent. Add the pepper strips and cook 2 minutes. Stir in the zucchini, salt and garlic powder. Cook 1 – 2 minutes until tender. 4. Add 1/2 cup Parmesan cheese, basil and parsley to the cream sauce. Drain the ravioli and add to the cream sauce. Add the skillet vegetables. Toss to coat. Veggies and cream sauce mixed together. 5. Transfer to a serving dish and sprinkle remaining cheese over the top before serving. Ready for serving. Makes a colorful presentation. SOURCE: I made major modifications to a recipe from Taste of Home. One of the items I always keep in my pantry is at least one box of chicken broth. 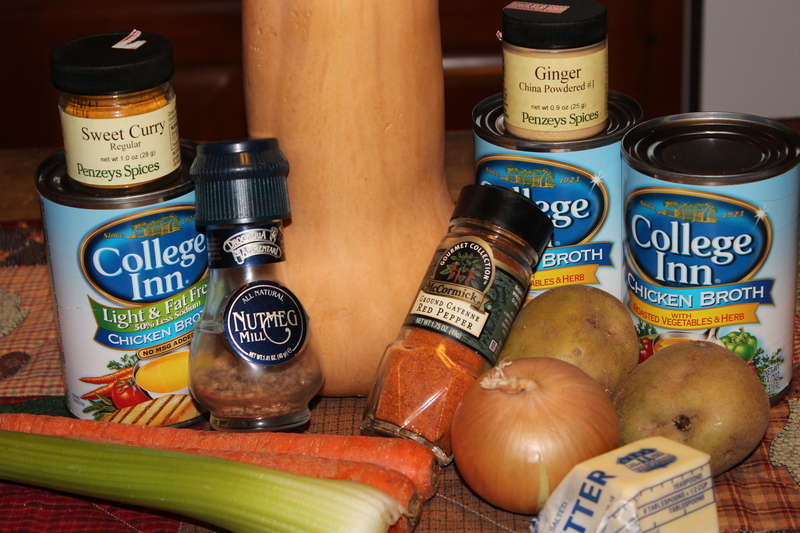 I reach for it when I make a quick sauce or to moisten a leftover casserole. But more important it’s the way to fast flavorful dinners. Obviously its used in soups, but I also use it to whip up dishes like risotto, or a one-pot meal such as the one I have for you today. If I had all the time in the world, making my own chicken broth by simmering meat, bones, and vegetables for hours would be ideal, but I don’t, so that’s why I love boxed chicken broth. I have cans of broth on my shelf too, for when only small amounts are needed, and I know I’ll use all of it, but for convenience, you can’t beat the box. Pop the top and you’re ready to go. Even when opened it keeps a long time in the refrigerator. If you haven’t gotten around to trying boxed chicken broth, try it once for the convenience, but be sure to choose one with reduced sodium content. This recipe for penne pasta with cauliflower and butternut squash goes together quickly, is a wonderful combination of flavors, and best of all the pasta cooks right in the broth with the vegetables, getting all that extra flavorful. The starch from the pasta combines with the broth as it simmers and creates a thickened silky sauce. And because its all cooked in one pot, cleanup is a breeze. The dish can be vegetarian/vegan by using vegetable broth instead of the chicken, but expect the sauce to be a little bit darker in color. We loved this dish as a meatless meal, served with a green salad, but it would also be a great side dish to baked chicken, pork or fish. 1. Heat oil in a large saucepan over medium-high heat. Add garlic, thyme and crushed red pepper and cook, stirring, for 1 minute. Add cauliflower and pasta to the pan with chicken broth. Bring to a boil over high heat. Reduce heat to a lively simmer and cook, uncovered, until the pasta is tender and the liquid is thickened and greatly reduced, 14 to 16 minutes. Remove from heat, stir in pepper and let stand for 5 minutes. Serve topped with cheese. Serve topped with grated Romano cheese. As many of you are probably doing, I’m making out my menu for Thanksgiving Dinner, checking the cupboard for what I have on hand and what I need to get. My shopping list is close at hand. There are certain dishes that are alway present on my Thanksgiving dinner table because it’s a favorite of someone in the family and they want to enjoy it once again. Each year I try to make one dish a little different than I’ve made it previously just to give it a new spin, or I introduce something new. This year as my guests arrive, I will be serving small cups of soup along with a cheese board and crackers. The soup is one which I have made many times before, but never served as an appetizer, so we will have to see how that works out. Because it is a favorite of my husband and me I’m sharing it here. We usually have it with grilled cheese sandwiches, and it makes a very hearty meatless meal. You might also want to serve it in small cups as a appetizer for your holiday meal as I will be doing. The recipe has gone through several adaptations, but was originally given to me by a co-worker, who was a wonderful French cook. She grew a big garden every year and just had a special way of using all those vegetables she grew. 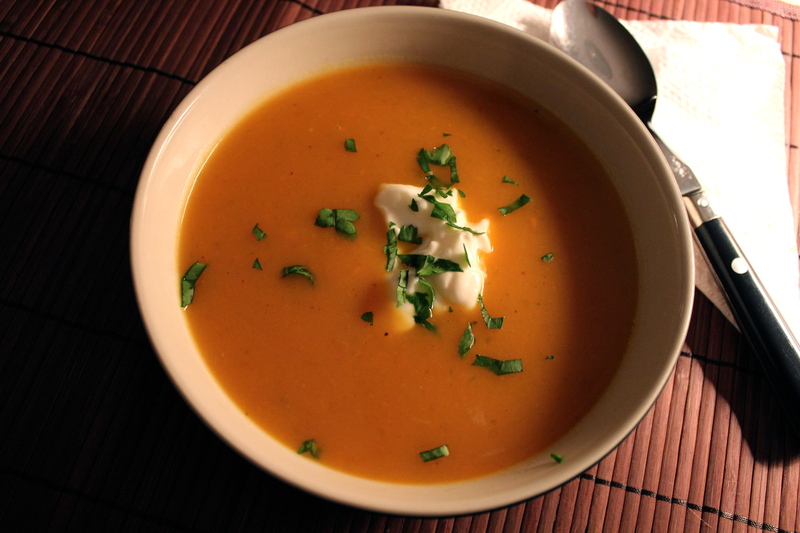 Her soups were outstanding, and I’m fortunate that she shared some of her recipes with me. They are some of my very favorites. 1. Melt butter in a large soup pan. Add onions, carrots, and celery. Saute for 2-3 minutes. Saute onions, carrots, and celery. 2. Add potatoes and squash to the pan; followed by the broth. 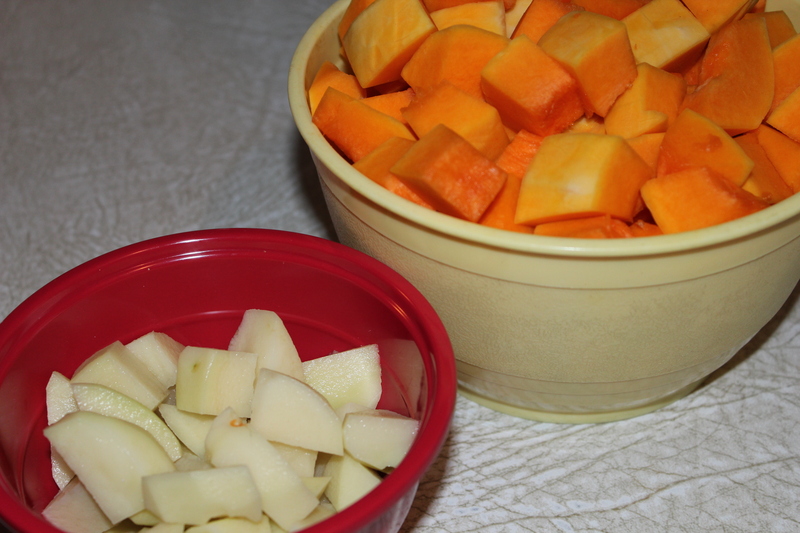 Potatoes and squash ready to be added. Bring to a boil. 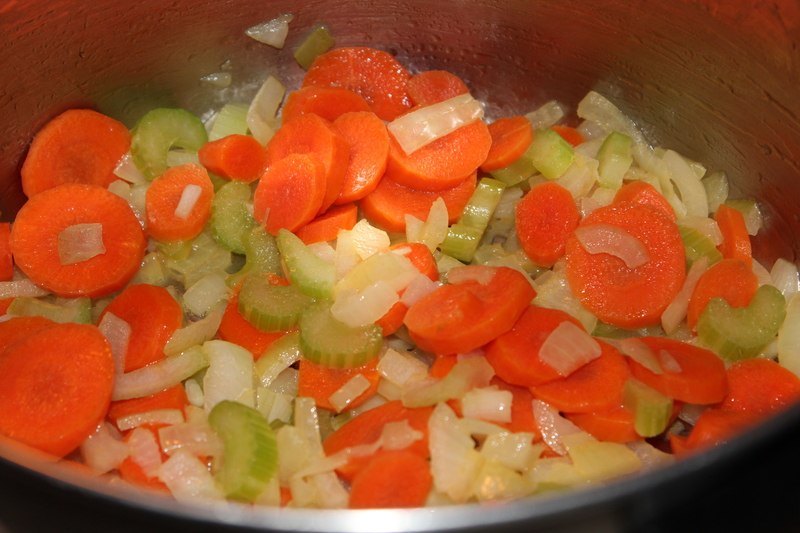 Decrease heat, cover and simmer till vegetables become very tender, approximately 40 minutes. Add the curry, nutmeg, ginger and cayenne. 3. Puree the soup mixture using an immersion blender, or regular blender working in batches. Return soup to the pan. Add salt and pepper to taste. Keep warm till ready to serve. 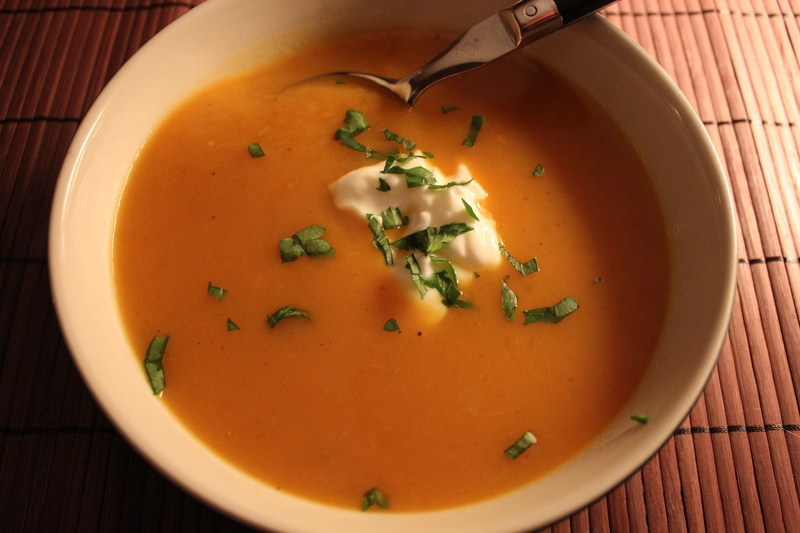 Serve hot with a dollop of sour cream on top. This is the perfect use for a fall vegetable. SOURCE: With thanks to Ann N., my friend, who was so generous in sharing her recipes and cooking talents with me.